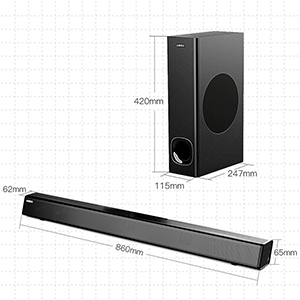 Clear & Powerful Sound: 110dB and 120 Watts Stereo Audio Sound Bar with four full-range speakers and dual tweeter drivers bring you a fantastic home theater surround sound experience. A wired external subwoofer enhances sound effect and blasts the bass for more immersive audio. Wired & Wireless Connection: Equipped with optical, coaxial, and AUX input. Works with any device, such as flat-screen TVs, computers, tablets, and AV receivers for an immersive surround sound experience. 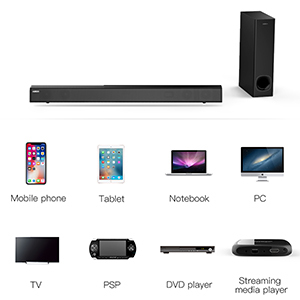 Connection via Bluetooth 4.2 allows you wireless music streaming from almost any device at a range of up to 15m(50ft). Ultra Slim & Sleek Design: 34-inch length with 120 watts output, a good match for any 35"+ flat-screen TV to get richer and crystal-clear dialog for all your TV shows, movies, and videos. Perfect balance between dialog and background sound. 4 EQ Audio Modes: 3D/News/Music/Movie modes make each experience unique. 3D mode fills the room with surround sound, News mode provides crisp and clear dialog in TV shows, Music and Movie modes give louder sound and stronger power bass. Easy to Use & Operate: Via the in-unit buttons or included high-sensitivity full-function IR remote, you can change sound input modes and the treble and bass settings at the click of a button whilst also selecting a music mode that heightens music, movies or dialog to be played at its best.